Looking for a quick meal to make after a long day at work. Something that everyone loves to eat. I make it from regular pantry ingredients so it is always something I have on hand that I can make at a moments notice. Brown ground meat with onions and green pepper. Once browned drain grease if there is any. Serve on hamburger buns or buns of your choosing. 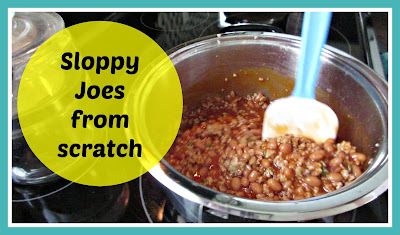 I usually serve sloppy joes with french fries which is quite a treat in my house because I am probably one of the only people on the planet who does not care for french fries. What meal do you always have the ingredients on hand to make?